So far as I know, Tangiers is about 6000 miles from Bangkok. I just worked a 14-hour shift, followed by a ride home in the snow with a failing headlight. And did you notice it just got real late? Anyhumps. I got three tins here, and they all sorta look alike. In fact, if one were less perceptive than I happen to be right now at 3:03 am, one could be forgiven for thinking that they were the same. There was a time when I was easily fooled, but that time has passed. Crazy like a fox, dig? The two Sumacos are from far corners. Sort of the same art, with the big juicy tomato and the fish. Then you got the Marock. The Thai Sumacos were reviewed by one of us sometime ago. They held up. These other ones, the North-African pretenders, well, we'll just have to see. Will wonders never cease? Who would've thought there could be so many different brands of tinned sardines? I like plain old mustard myself, but I can see that I shall have to look more closely at those parts of the aisle when shopping. Great blog! What the Hell? 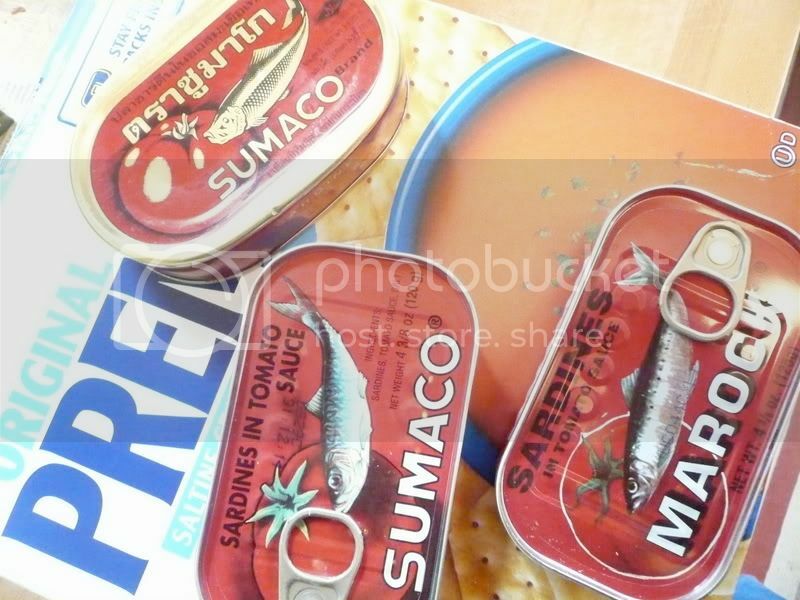 Counterfeit sardines? I can understand trying to pass off a Roltex watch, but sardines? Hey Carolyn, this is just the tip of the iceberg. They haven't even scratched pickled herring or smoked fish yet. You haven't reviewed the Marock yet.